U stands for unleashed–or is it unhinged? U stands for unleashed, as in Unleashed in Oregon. Sometimes “unhinged” might be a better assessment. Last Monday, for example. Exhausted from my Easter festivities, I was ready for a long, deep sleep, but no. At 2:38 a.m., Annie started barking, and she was still barking off and on five hours later. She seemed to have found a critter trapped under the deck. Whatever it was scratched her face during the night. Or else she scratched it on the lattice along the base of the deck. The intruder couldn’t be very big. I had seen a rat sneak in and out a couple times at twilight, but Annie hadn’t seemed to notice. We occasionally had squirrels. I suppose a cat or small raccoon could have gotten in there if it was determined enough. Whatever it was, Annie was still barking, and I was still awake when it was time to get up. Sleep-deprived or not, I had a busy day that included a business meeting and providing music for a funeral, but first I crawled around on the wet grass in my bathrobe trying to see what was under the deck. I saw nothing except a muddy spot where Annie had tried to dig her way in. I thought about shooting some water through there, setting a trap, or calling the exterminators. What I wanted to do was ignore it, but if Annie was going to keep barking, I’d never get any sleep and the neighbor would eventually select a rifle from his vast collection and take care of both Annie and whatever she was barking at. Somehow, like our recent adventures with plumbing and yard work, we would handle it. 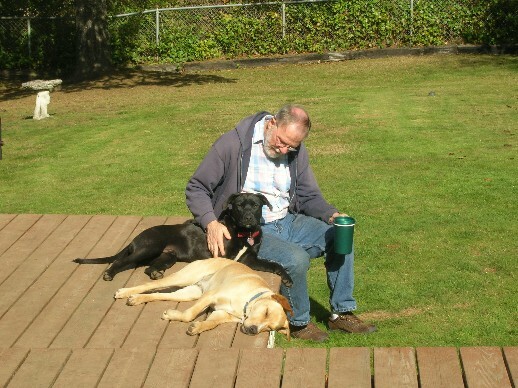 Once I inspected the deck, Annie seemed satisfied for the moment and went to sleep. Now the rain has returned, and Annie is staying in her warm bed during the night. Me too. But the invader is probably still around. When Fred and I moved to Oregon in 1996, we unleashed ourselves from our families, our home, our jobs, and everything that was familiar. Looking back, it strikes me that we were like dogs who smelled something good way up the road, chased after it and found ourselves in an unfamiliar place with no way to get back. So we started new lives here. It was indeed very good, although we missed the old lives sometimes. Now that Fred is gone (three years ago yesterday), I am even more unleashed. No husband. No newspaper job. In theory, I’m free to go wherever I want, just like the dog when she slips out the gate and runs into the woods. But also like the dog, I don’t want to wander too far from home. I want my Milk-Bones (see M is for Milk-Bones) and my iced tea. Of course some of my family thinks I’m just unhinged. This blog is about my adventures with Annie in our post-Silicon Valley lives. We are unleashed and running free in Oregon. Metaphorically speaking. They’ve got leash laws up here, just like most places, and my dog is too much of a wackadoodle to unhook just anywhere. U stands for a whole lots of “un” words. Unlikely, unbelievable, unwanted, unplugged, underdog and so many more. It also stands for ugly, ubiquitous, utopia, and umbrella, something we don’t use here because it would just blow inside out. And it stands for Under the Deck, where something lives. More than 2000 other bloggers have signed up for the challenge. 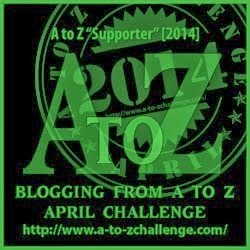 For more information, visit a-to-zchallenge.com You might find some great new blogs to follow. I know I will. Visit Writer Aid tomorrow to find out what V stands for. I don’t want to wander too far from home…so true. You're not unhinged, just human. And very brave to keep on keeping on. Stopping by via the #AZchat today. I hope you figure out what that critter is; we keep our dog inside at night, otherwise I'm sure he would find some critter to chase as we have opossums, skunks, and racoons around. You seem to be content with where you are unleashed at; I think that is a good thing.